It’s definitely true that playing with dolls expands a child’s imagination. There are no limits to what a young girl can dream up when she’s left alone with her favorite toy and the expanses of her mind. 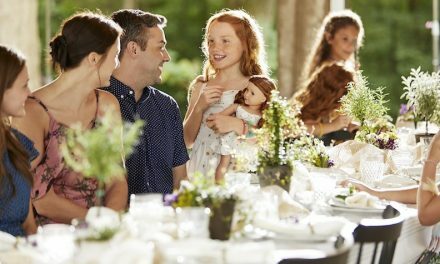 The American Girl doll company has long shone a light on what has made young American girls tick yesterday, today, and, perhaps most important, tomorrow. 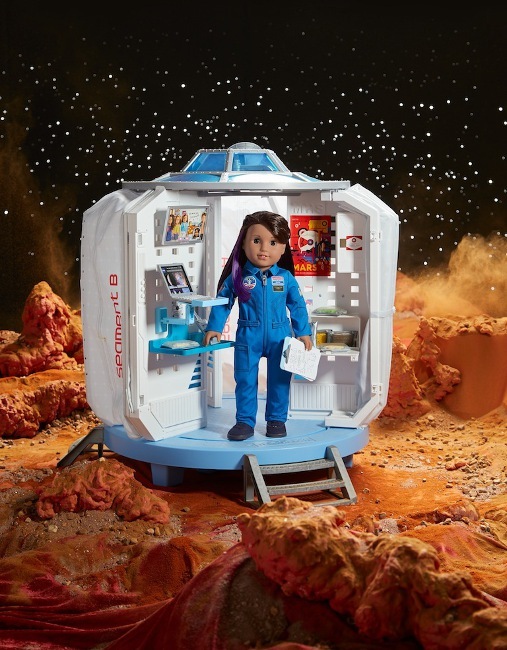 New American Girl doll Luciana Vega aspires to travel to Mars.With their brand-new release for 2018, Luciana Vega boldly goes where no American Girl has gone before. The design team has created a very bright, scientifically inclined, mathematically astute, and ambitious young heroine who wants to become the first American astronaut on Mars. 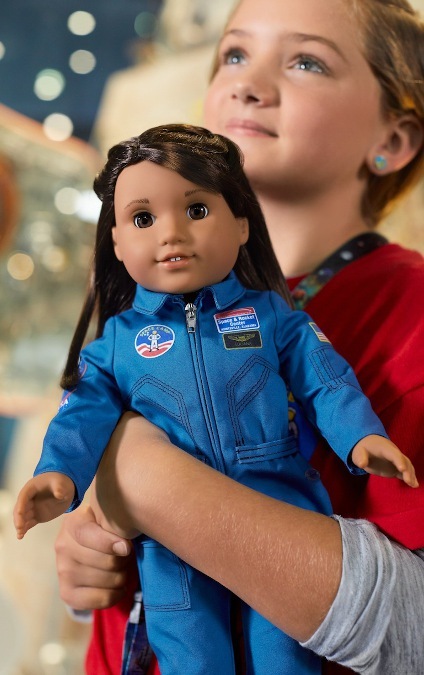 Whereby other dolls might be giggling and gurgling after making a “boom-boom” in their diapers, the American Girl doll is encouraging the youngest among us to envision themselves in challenging and courageous scenarios. Luciana and some of her accessories. Like all of their past debuts, the new Luciana doll will be accompanied by fictional stories that put her biography and her desires in easy-to-understand and engaging prose. Their author is a former scientist turned full-time writer named Erin Teagan, and she brings her deep connection to the world of biochemistry and the life-science disciplines to these novels. They chronicle the development of Luciana from a kid who excels at Space Camp to a youth astronaut trainee. One of the companion books by onetime scientist Erin Teagan. Along the way, of course, Luciana learns lessons that go beyond the STEM core curriculum. Understanding science, technology, engineering, and math — the building blocks of STEM — is just part of what an astronaut needs. Luciana discovers that there is much to know within herself, in addition to what lurks outside Earth’s orbit. The second title in the Luciana Vega book series. 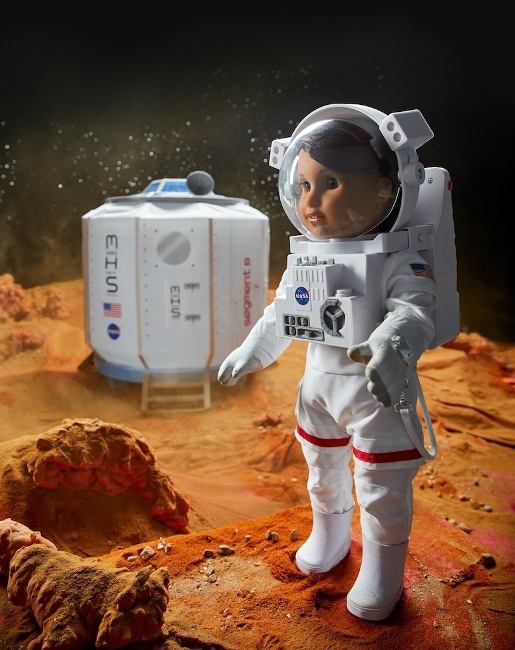 The 18-inch vinyl doll comes with a multitude of STEM-inspired accessories, outfits, and merchandise that mirror what a young Scholarship-winning, aspiring astronaut would own and want. There are flight suits, spacesuits, a Maker Station, and a Mars Habitat, which comes complete with science and research essentials. Luciana in her Mars Habitat. 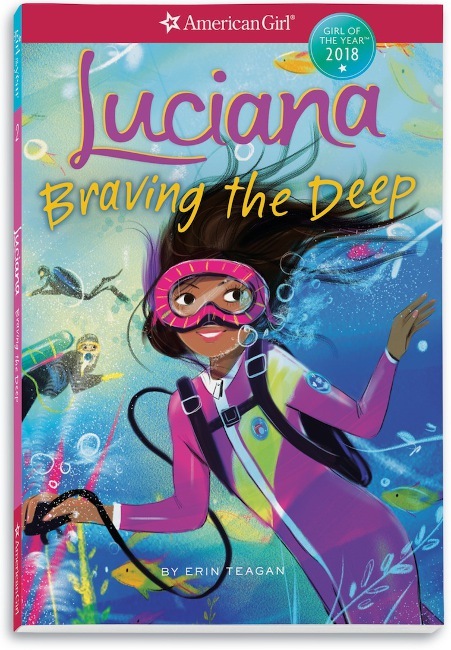 Recognizing how American girls today are much more tech-savvy and technologically advanced than even tweens were a decade ago, American Girl has launched an app that will expand and strengthen young girls’ immersion into Luciana’s world. By downloading the app and scanning the catalogue pages and Luciana’s products, girls will be able to unlock exclusive, bonus content. They will be able to experience augmented reality, special trailers and videos, as well as participate in space simulations, take challenges, and do quizzes. 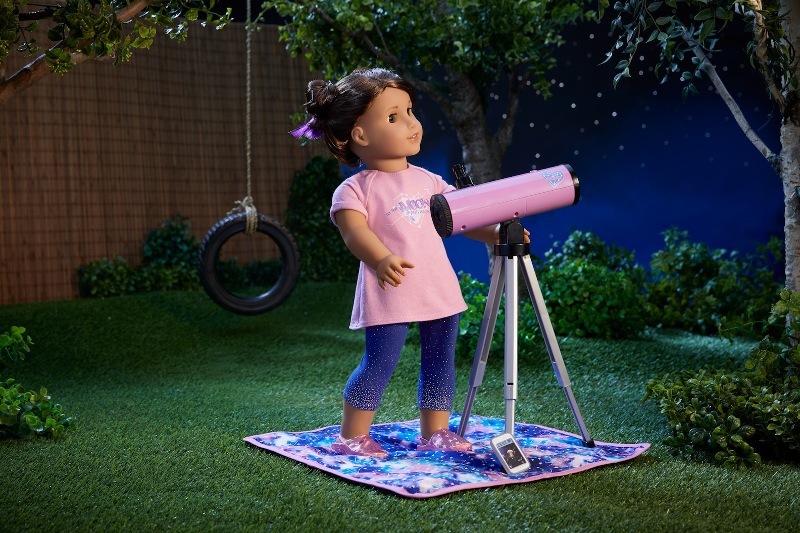 It provides a galaxy of gadgets and inspirational content that will definitely send science-loving girls over the moon. 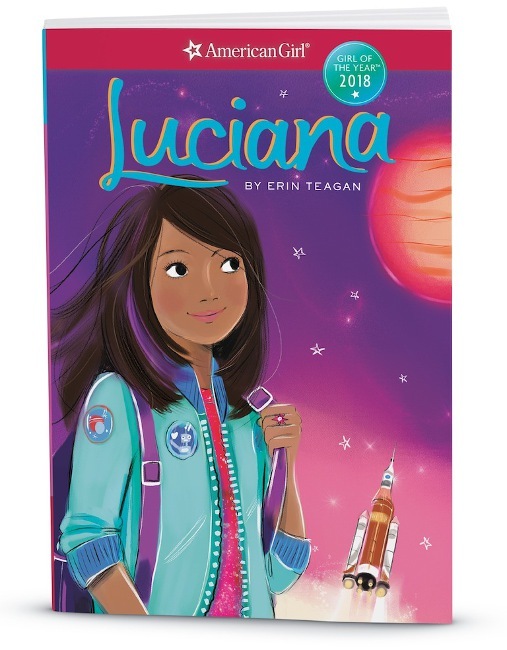 As a commitment to further American children’s appreciation of the sciences, American Girl has partnered with NASA, Space Camp, and Scholastic Books to fund Blast Off to Discovery, an educational program that helps third- to fifth-grade students explore the mysteries and allure of space through Luciana’s experiences. Geared for male and female students, the program will be available starting on January 31, 2018. It can be accessed via www.scholastic.com. 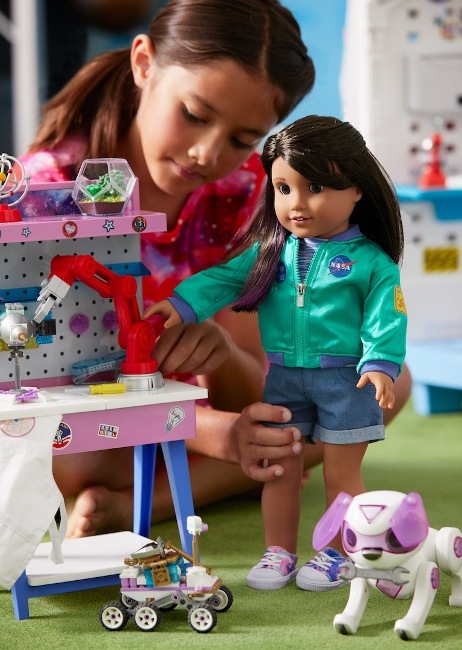 In addition to the classroom forums, American Girl and Scholastic are also collaborating to bring the STEM message home. Families are encouraged to participate in their Mission to Mars Sweepstakes. 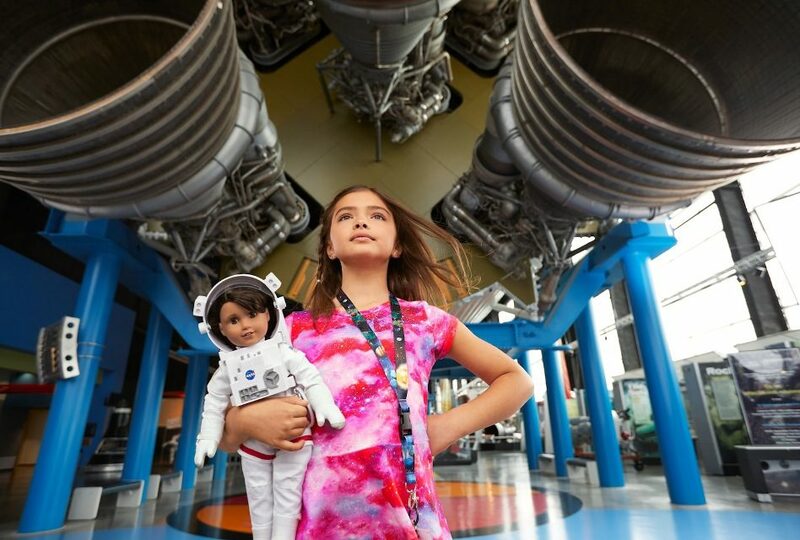 In this venue, families can go on a series of weekly “missions” to win assorted prizes — the grand prize is an actual visit to Space Camp, in Huntsville, AL, which is valued at more than $2,000. Kicking off throughout January 2018, the Luciana Vega apps, online play, and retail events will hopefully cultivate the confidence that some young girls lack to follow a path in the math and science fields. As more and more young girls and women see that the world is becoming increasingly digitally based, technically driven, scientifically biased, and robotically engineered, they will realize that these are all vocations that offer them opportunities to achieve, excel, and make a difference. To aid in this admirable drive to inspire and motivate, Dickson and her colleagues amassed a panel of top-notch, first-rate female scientists: Dr. Deborah Barnhart, CEO and Executive Director of the U.S. Space & Rocket Center; Dr. Megan McArthur Behnken, NASA astronaut; Dr. Ellen Stofan, the former Chief Scientist of NASA; and Maureen O’Brien, Manager of Strategic Alliances at NASA. Having this quartet of esteemed women as their advisory board, the American Girl editors and product designers knew that this brand-new series was in capable hands. They could run ideas and concepts past this group and have faith that the insights would be valuable and personalized. 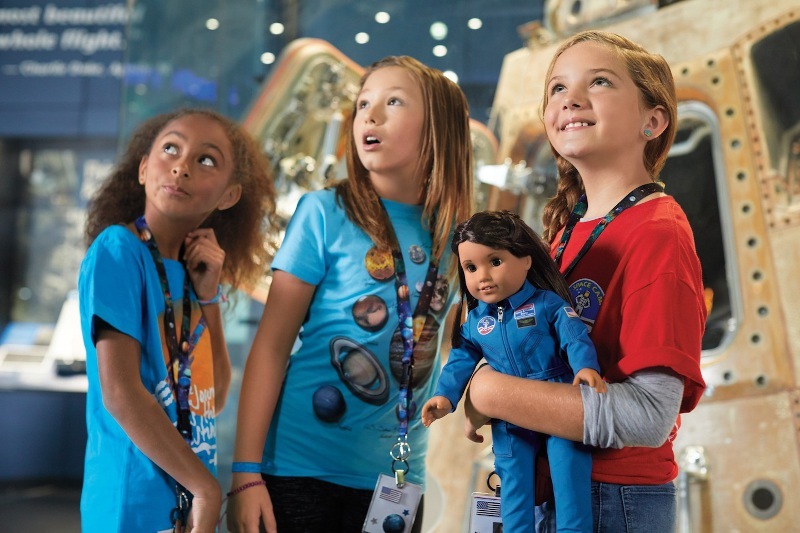 Likewise, the American Girl team went to Space Camp and also to NASA’s Johnson Space Center in Houston. While they were there, they learned what it was like to be a Space Camp trainee. They picked up the fine points of how to conduct a mission in micro-gravity, how to dress in the different flight suits and spacesuits, and what it feels like to spend time training to possibly fly through the stars one day. 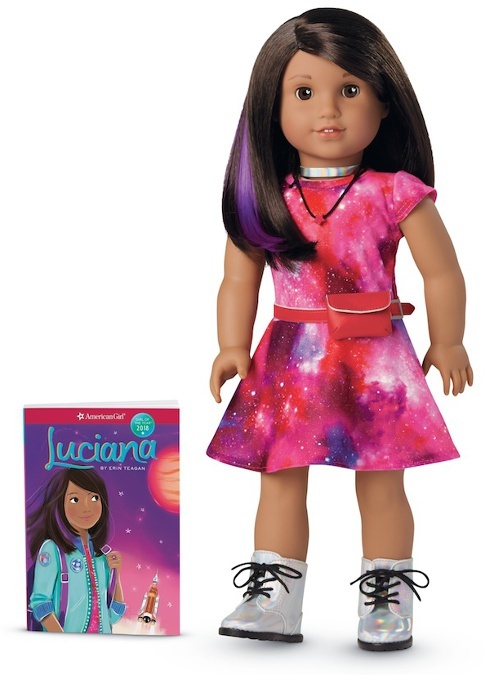 The Luciana Vega doll pays homage to an American girl of Chilean descent who is motivated to dream big and to aspire grandly. Her dark hair has a purple streak in it to showcase her unconventional, creative side. 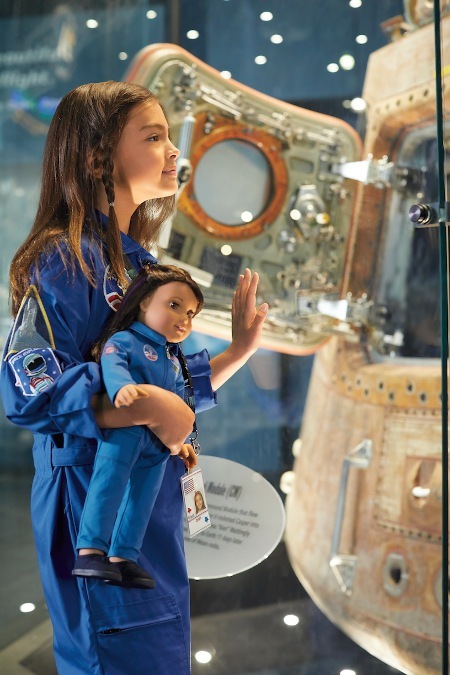 The doll embodies the spirit of many 11-year-old girls: Children who are growing up in a world of artificial intelligence, cyber conversations, and knowledge that can be found at their fingertips. 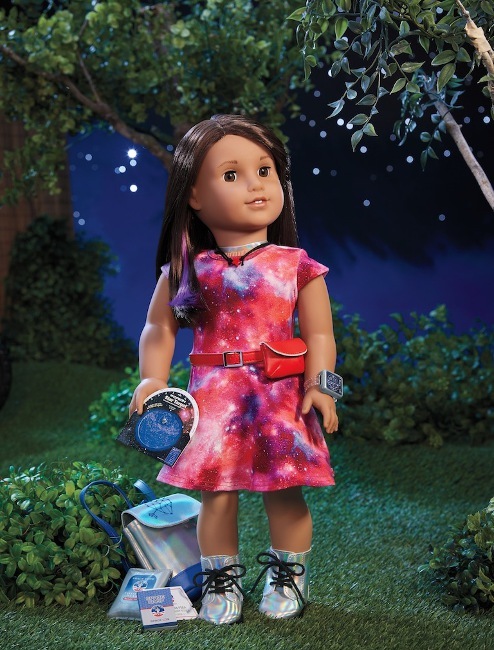 The American Girl line of dolls has always focused on finding that indomitable part of the American spirit: the can do attitude that has shaped and built this nation. 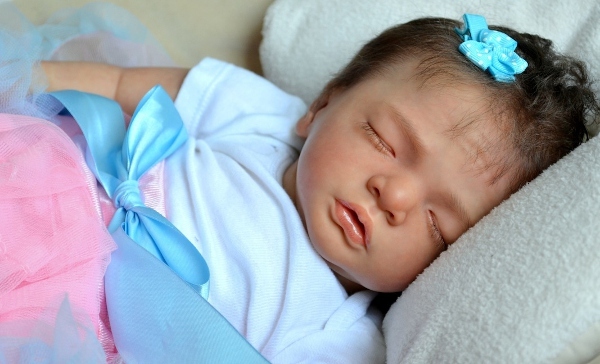 This year’s doll takes that optimism and brings it to a whole new, potential frontier. Playing with a doll may not be rocket science, but playing with THIS one can be the start of a rocket scientist’s career. 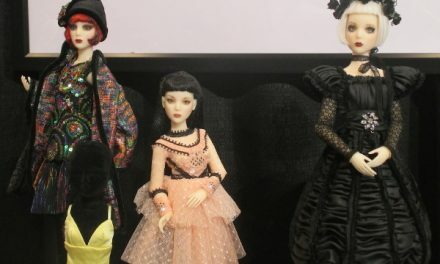 Dollars and Dolls: Making dolls and a living is the American dream, and beyond.